A set of chess pieces and board have presented to you. Those are made of solid Teak wood and carved by talented craftsman. A great wooden chess which perfect for your outdoor chess game. Why outdoor? 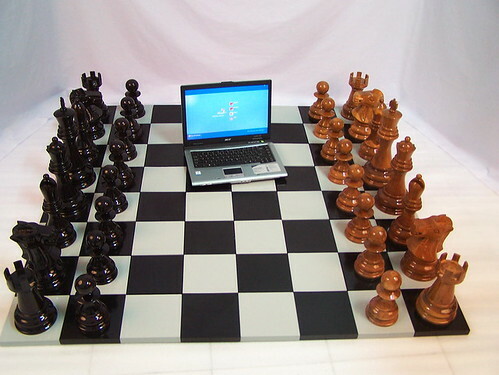 These chess set are carved in giant size and you should consider about its place. The giant chess need wide enough area to lay with its squares board and the perfect place is outdoor, such as; garden, backyard, camp area, villa, and other amusement place. Outdoor chess is popular game and often played in holiday or weekend. Kids and adolescent also enjoy this game. They like to use the wooden giant chess which completed with squares board for the game. Just as in the picture above, the Teak chess pieces and board may suitable as your outdoor chess game. Support with these chess set, your outdoor chess game will be wonderful.